Help your child understand global warming. Global warming for kids can be a tough subject to approach. Not only are there conflicting scientific views regarding global warming, but you also don't want to give your young children the idea that they are inheriting a doomed Earth. When and if your child comes to you and asks you to explain global warming, you need to know the basics yourself so you can effectively explain it to your child. Global warming refers to the gradual temperature increase that the Earth has experienced and is projected to continue to experience as time passes. The climate change pertains to both the temperature of the air and the temperature of the oceans. Even a small change in the climate - whether warming or cooling - has the potential to have a profound effect on the Earth's environment. As glaciers melt and water levels rise, scientists scramble to figure out the cause and the remedy to global warming. A popular scientific opinion regarding global warming is that it is caused largely in part by the pollutants released by humans into the air. Conflicting views are also accepted by some scientific communities; some environmental experts balk at the idea of humans having such a huge effect on the Earth's climate. Experts also disagree as to whether the gradual increase in temperature will result in catastrophic results, as predicted by some environmentalists. What causes the temperature increase? Can the temperature increase be minimized or halted? Should the temperature increase be minimized or halted? What effect will the temperature increase have on the Earth? How profoundly will global warming effect weather? Depending on your child's age, you may not want to go deeply into detail when you first discuss global warming. For example, a four year old will probably not understand the term "carbon dioxide," but you can use the fizz of a soda to demonstrate this greenhouse gas. You can also experiment with varying temperature levels and see what effect the levels have on ice cubes, plants, and other items. 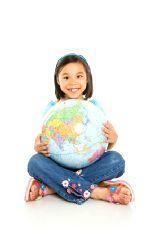 Using visual mediums may help your child to understand the concept of global warming better. What do you think will happen if the Earth gets hotter and hotter? What do you think causes global warming? What can we do to help the environment? You may be surprised at some of the profound responses your children can come up with. If you are looking for a book for yourself to help you understand the complicated concept of global warming a little better before attempting to explain it to your child, try The Complete Idiot's Guide to Global Warming. The Environmental Protection Agency hosts a website geared toward children aged four through ten. Global Warming Kids features a comprehensive website with many different projects and suggested readings on the topic of global warming. The Pew Center on Global Climate Change has a great question-and-answer page which explains the fundamentals of global warming in a kid-friendly way. If your children initiate questions regarding global warming, you should do your best to answer their questions while also applauding their environmental awareness for having asked the question to begin with. How to Make a Potato Battery By Erin Coleman, R.D., L.D.